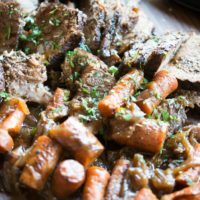 This Instant Balsamic Beef Roast is fall-apart tender, bursting with flavor, and cooks in half the time of a traditional pot roast! Cut the carrots into thirds, then peel the onion and cut it into sixths. Season the beef with salt and pepper. Add 1 tablespoon oil to the instant pot and set it to “saute.” Once hot, add the beef to the pot and sear for 4-5 minutes per side until the beef is browned. If your roast is too large to sear, cut it in half first. Remove the beef from the pot and set aside. Add the additional tablespoon of oil to the Instant Pot, then add the carrots and onions. Cook for 2 minutes, then flip and cook an additional 2 minutes. Add the broth, balsamic vinegar, and Italian seasoning into the pot with the carrots and onions. Place the beef on top of the vegetables, then place the lid on the pot, ensure that the valve is set to “sealed” rather than “venting,” then press the “meat/stew” button and set it to cook for 60 minutes. Manually release the pressure after 60 minutes, then remove the beef and set the pot to sauté for 10-15 minutes, until the juices have reduced by about 1/2. Shred or slice the beef to your preference, then spoon the sauce over and serve alongside the onions and carrots. Enjoy! Round roast or shoulder roast will also work here. To make in a crockpot: follow the instructions but add an additional cup of beef broth and cook on low for 8 hours or on high for 4.